If there's anything better than having your own food garden, it's got to be teaching the next generation how to do it themselves. 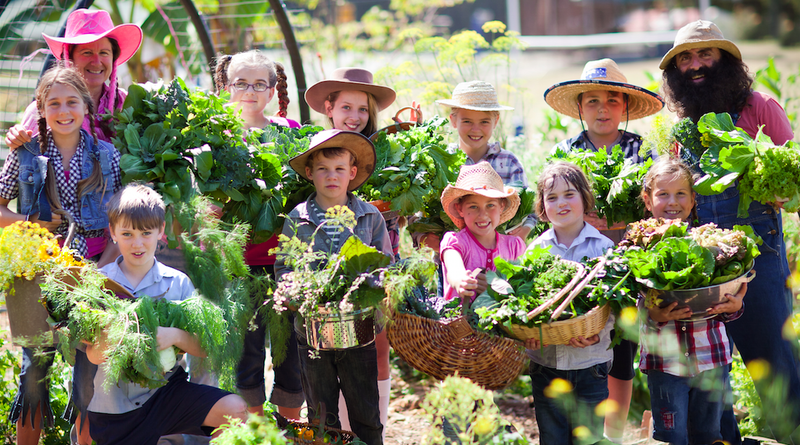 Leonie Shanahan, of Tewantin, Queensland, has made the creation of edible gardens in schools her speciality. SINCE the 2000s, I have been encouraging school communities to adopt the Edible SchoolGardens program to promote healthy food and “getting their hands dirty” by growing their own fruits, vegetables, herbs and compatible flowers. Well, the concept has certainly taken off! Edible School Gardens are no longer a novelty, but considered an important part of the school ethos. On Harvest Day the theme was 'The Year of the Farmer' which could explain the way the group is dressed. Leonie is at left, Costa Georgiadis at right. While this is exciting, we still have a long way to go in changing the eating habits of children. In my program, Edible School Gardens, it’s all about empowering the students with the information. Today I will focus on one school ‑ Our Lady of the Rosary at Caloundra onQueensland’s Sunshine Coast. This gardens program is the same that I have run in public and private schools throughout Queensland. Firstly, you teach the students about permaculture and design and get all students to come up with a design that reflects what they would like to see as their school garden. As a class, we get those ideas down to one final design and eventually, with my guidance, come up with the “master plan”. Notices are then sent out to parents and carers about our upcoming Edible School Garden Set-Up Day. The excitement is building ‑ the students can’t wait to get their hands dirty! Materials are sourced locally – some second-hand ­‑ and must be on site by early set-up day. It’s a wonderful community-building day for the school. Parents, grandparents and permaculture friends arrive to help students with their garden. “How to” signs are placed around the garden space giving clear instructions of processes for each element – such as no-dig gardens, herb spirals, worm baths and arches. At this stage, I would have to say the principal and teachers have put a lot of trust in me. All they can see is product everywhere and bare ground, but it is the most magical day just watching students and helpers work together as teams, the excitement of “getting dirty” and the anticipation of seeing their design come to fruition. No Chemicals in our garens, these gardens are all about health - healty of the soil, of us, and of all the creatures that live below and above. The process: I arrive before the students to mark out the design on the ground using dolomite. Materials are laid out and labelled – clearly. Instructions are put on walls, fences and boards. We have to pre-organise people to look after the tea, coffee and food for helpers. Soon the coffee cart arrives, and so do parents! We do the heavy jobs first as that’s normally when you have the Dads on site. Their jobs are digging trenches for herb spirals and the placement of rocks, and trenches for garden edgings. Never underestimate how much work children can do, they will work non-stop, so make sure there are breaks for food and drink. Find your leaders (student or parent) and give them ownership of part of different projects (as there is only one of me). At the end of the day, the student’s design has been transformed into a reality and they are SO PROUD – there is ownership there, not just for today but always, well beyond their school years. The No-Dig gardens need two weeks to allow the rich, healthy soil to cool and settle before seedlings are planted. The students are so excited to plant the garden up (and I have 100’s of seedlings and herbs to be planted) that we must ensure each student gets to put their first plant in. They have to be patient, though, as I remind them how to plant and where different plants will get planted and how to water them. As the year progresses, the students have learned all about compost, worm farms, different types of gardens, maintenance of plants, how to harvest and, most importantly, they get to eat their healthy organic garden produce. No chemicals in our gardens, these gardens all about health – health of the soil, us and all creatures that live below and above. Each year we have a Harvest Celebration, and Our Lady of the Rosary school does it so well. Once again, this is a community-building event, lots of parents and all teachers are involved from planning stage. This is a big event and, for me, it completes the cycle of what an edible school garden program should be. Early on the morning of Harvest Day, we harvest all the food from the garden, other ingredients have also been purchased and students come with their recipes and collect the items they require. All 400 of the Our Lady of the Rosary students are involved in our celebration day. All students cook. We don’t have a kitchen, except in the staff room, so every classroom becomes a kitchen for the morning. We sing and dance, play garden-related games (scarecrow-making competitions, thong throwing, roll the pumpkin, bike-pedal water competitions) and celebrate how lucky we are to be able to grow our own food. When we eat, we use arrowroot and mulberry leaves as plates, and those leaves go to the chooks or compost afterwards. Our cups and utensils are all purchased from “op shops” – this promotes recycling and supporting businesses that are ethical. On the oval we set up all the tables – one for each class. When the food arrives, it’s a kaleidoscope of colour and the proudest moment for me. At this particular Harvest Day, there were probably only two students who weren’t comfortable trying all this new food, but for the rest of the students it was their food and they loved it. Our Celebrity Visitor at this event was Television’s gardening guru Costa Georgiadis, who is a favourite Harvest Day guest. Edible School Gardens can change eating habits for students for life and encourage them to make positive, healthy lifestyle choices. Never underestimate how much work children can do - they will work non-stop, so make sure there are breaks for food and drink.